The line electrification covers the stretch from Holytown to Mid Calder. Work to complete the electrification of the Glasgow-Shotts-Edinbugh rail line is about to get underway. The two-year project will see upgrading between Holytown and Mid Calder. Carillion Powerlines Ltd has won the £49 million Network Rail contract and the work is due to be completed by March 2019. 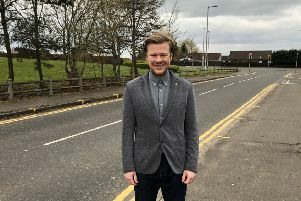 It will mean quicker journey times between Scotland’s two biggest cities on a route that includes Uddingston, Bellshill, Holytown and Carfin. Network Rail says electrification will also lead to improved reliability and increased capacity for passengers. A spokesman said there will be only limited disruption to services as much of the work will be done overnight. Commuters should not be affected. Trains are being replaced by buses at weekends during January because of work linked to electrification. Transport Minister Humza Yousaf said: “The Scottish Government’s funding of the electrification of the Shotts line, and our overall £5 billion package of investment in our railway, demonstrates our ongoing commitment to the Scottish rail network.